What’s not to love about beaded bracelets? I’ve had a longtime love affair with beaded bracelets. Never met a beaded bracelet I didn’t like. They’re fun to make, fun to wear, and everyone likes a bracelet or two (try pairing up a couple of different bracelets sometime when you feel adventurous). Really, the thing I love the most about them is that you can casually glance down and admire them whenever you feel like it. There’s nothing like a new beaded bracelet to add a little pick-me-up to your favorite outfit! Beaded bracelets can be made by just about anyone with any set of beading skills! 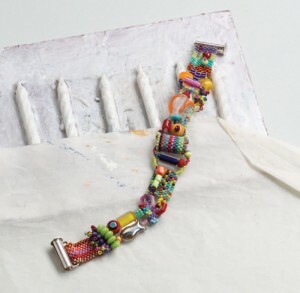 Whether you love to do stringing, wire work or off-loom beadweaving, you’ll find a bracelet making pattern that you love. If you have been interested in learning how to make bracelets with beads, get ready to feel inspired! 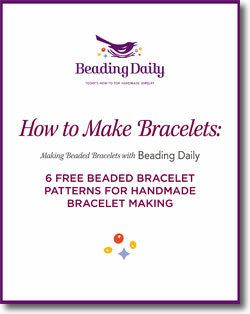 Interweave experts compiled six free, handmade beaded bracelet patterns to get you started. 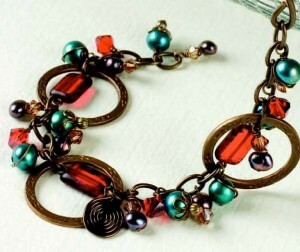 All you need to do is download your copy of the free tutorial, pick up your bracelet-making supplies and start today! Choose one beaded bracelet making pattern or try them all: seed beads, crystals, pearls, dangles, ceramic—we have you covered. These are several of our most popular beading patterns, sure to whet your appetite and get you going on some serious jewelry making. To create this piece, you will suspend various types of beads, pearls, and crystals in textured “eternity garden” brass rings and make groovy gunmetal wire spirals. This modern bracelet design will complement any outfit. If you like bead bracelet making, you will definitely enjoy stringing the beads and attaching dangles to each link of chain in this jewelry project! 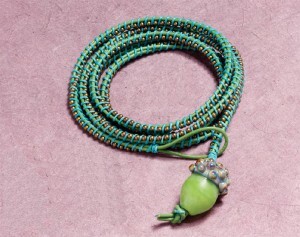 Peyote-stitched, seed-bead tops turn ivory vintage beads into cute little acorns! Here, Barbara strings several of them together with pressed-glass leaves to form a bracelet you’ll go nuts over. 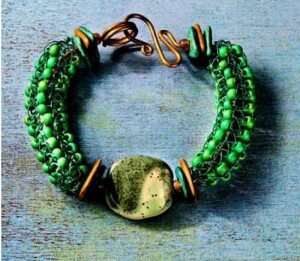 Use this design as an inspiration to create a handmade bracelet that is both organic and creative. Combine the subtle to darker shades of rose and purple with Bali silver for some great hombre seed bead beauty in this beaded jewelry design. If you are going to be making beaded bracelets, you have to try this pattern. You can also play with the combination of colors. Do you have a special occasion coming up? Use this bracelet design as an inspiration to make jewelry that matches your outfit. Once you make one of these flowers, you’ll understand the inspiration for this piece. They are so fun to make and wear, you won’t want to stop. Woven onto hand-dyed silk with a right-angle woven vine, these blossoms are a wreath for your wrist. Using tubular peyote stitch to form the base of the flowers, netting stitch to add the petals and simple wire worked loops to add the centers. 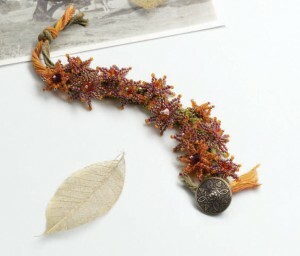 Small, medium, and large flowers are made by varying the quantity of seed beads. This beaded bracelet uses spool knitting, a yarn technique that has been around for years. Jewelry artists have now incorporated wire on spool knitters. Follow these bracelet making instructions to insert plastic tubing and wire into the spool knitting in order to keep its form. The design possibilities are endless. By adding the heavy-gauge wire to the center core, the bracelet not only has the extra support it needs, but it also simplifies the finishing process. If you’ve been making beaded bracelets for a while, you’ll enjoy experimenting with Donna’s technique. Collage in any medium, whether paper, paint, or beads, is one of Beth’s favorite techniques in the visual arts. She enjoys transforming beads of varying color, texture, size, and shape into a small piece of wearable art. The eclectic quality of bead collage is both a joyful pleasure and a wonderful exercise in creativity. Create beautiful handmade jewelry collage-style with this free pattern. Beth used vintage beads from her own collection for this piece. There are many fun contemporary beads available that can be substituted for the vintage beads shown here. Each of these beaded bracelet projects includes step-by-step instructions and great photography. As with potato chips, one simply won’t be enough. This collection of free beaded bracelet patterns will inspire you to kick your bracelet-making skills up a notch and keep on going. Challenge yourself with a new technique, choose an unusual color, make one for your mother-in-law, and try something out of the box. Most of all, enjoy your time spent beading! Download your copy of this free eBook today and add some new life to your collection of handmade beaded bracelets! Dive into your bead stash and get your wire, thread, and bracelet clasp to begin making beaded bracelets with our free beaded bracelet patterns. With these 6 FREE bead bracelet patterns, you’ll get a range of techniques and designs sure to impress. Learn how to make a bracelet with these free instructions and create something special for yourself or others!